These grill models have been discontinued. See The 7 Best Weber Grills of 2019 for more options. Let's compare the 2011 Weber Genesis E-330 grill up against a 2005 Genesis Gold C to see which of the two is the better overall package. The 2005 Genesis had 424 square inches of primary grilling space with a 36,000 BTU maximum output from its main burners. 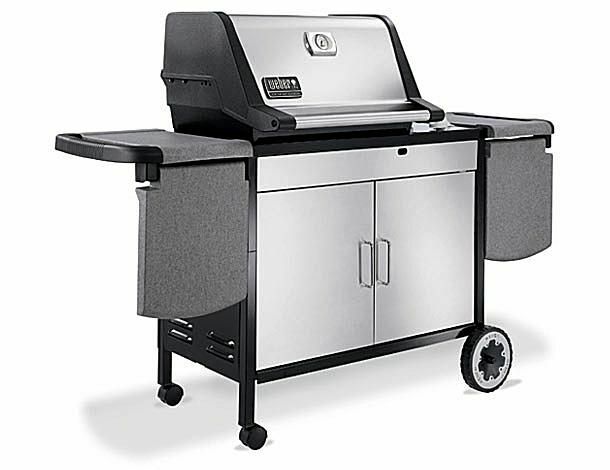 The 2011 Genesis has 507 square inches of primary grilling area with a 38,000 BTU maximum output (not counting the extra sear burner in this particular model). This means that in 2005, you got 85 BTUs per square inch. Now you get 75 BTUs per square inch. Genesis model years 2007 through 2010 gave you 82 BTUs per square inch. To be clear, the Weber Genesis grills are well built and very efficient, but efficient enough to provide high temperatures and fast preheat times with only 75 BTUs per square inch? The new version has a thinner cast aluminum firebox, but basically the same design. This means a small vent space along the back and a lid that closes tightly. To test the differences, both grills were set side by side on a sunny, but breezy day. The outside air temperature was around 50 F. Both grills had newly filled propane tanks and both were clean. The propane tanks were turned on and the burners lighted. On the old design, once the first burner is lit, the rest light on their own. With the new design, the burners have been turned around, and you have to hit the electric igniter each time to turn on the burner, but I still did my best to fire them up to full power at the same time. From the offset, it was clear that the older Genesis, with its extra 10 BTUs per square inch, had the advantage. After five minutes, it reached 430 F compared to the new Genesis' 370 F. After ten minutes, the lead was still around 60 degrees. The older Genesis reached 600 F., the maximum reading on the temperature gauge, in 13 minutes, while the new grill remained at 520 F.
How long did it take the new Genesis to reach 600? It managed to reach nearly 600 degrees after 30 minutes. The grate temperatures were also checked with an infrared thermometer. At 600 F, the Genesis Gold from 2005 had a grate temperature of 830 F, while the new Genesis E-330 at almost 600 F had a grate temperature of 790 F. Both of these temperatures are capable of doing some serious searing, but the question is, how long will it take to get there? Even with the E-330's internal sear burner running, it couldn't manage to heat up anywhere near as fast as the old Genesis without the sear burner, but it did get a grate temperature of 890 F, directly over the sear burner. This is an amazing temperature, even if it takes almost 30 minutes to get there. On the other hand, the new Genesis uses less fuel, so fewer trips to the filling station. The simple truth is that gas grills work by brute force. The more BTUs, the faster it heats up and the higher it goes. Poor quality gas grill makers boost the BTUs to show off and then put a large vent space in the back to keep the grill from damaging itself from high heat. The Genesis has always been an efficient grill, but in this new version seems to have taken it one step too far; after ​all, you are not saving fuel if you are preheating an extra 10 to 15 minutes. So it appears that the great Weber Genesis of old has become the really good Genesis of today; just plan on turning it on early to preheat. What Is the Char-Broil Advantage 4-Burner Model #463344015 Gas Grill?